Yesterday, President Donald Trump released his devastating budget for the 2018 fiscal year. It would dismantle public schools through massive cuts to teacher training, after-school programs in public schools, and transfers of public funds to private school vouchers. Every budget is a statement of values and this one could not be more clear in the vision it presents: starve the public school system and privatize education. The Trump budget would slash $9 billion—13 percent of the U.S. Department of Education’s funding—while investing $1.4 billion of new money in school choice, including private school vouchers, sending a clear signal that the Trump administration prioritizes ideologically driven voucher schemes over great public schools. For such a draconian proposal, the budget is remarkably short on details. Although it cuts $9 billion in education, only about $7 billion of cuts are specifically mentioned, raising the question of what other cuts the Trump administration is planning to make. Is the federal investment in career and technical education at risk, for example? It mentions a $1 billion increase in Title I but provides virtually no details about this proposal and implies that the funding would not run through the Title I formula, which provides more resources to high-poverty districts. Dismantling our nation’s public education system while investing in unproven schemes to incentivize private school vouchers that have no evidence of improving student achievement could have devastating consequences for students that could take decades to fix. This budget invests a whopping $1.4 billion of new funding in “school choice” and says that investment will grow to $20 billion annually. While woefully short on details, this proposal makes clear that the administration seeks to create a new $250 million federal program that will allow taxpayer dollars to flow to private schools, which are not accountable; can discriminate in admissions and discipline; and are not subject to basic monitoring, oversight, and civil rights laws. Decades of research on vouchers show that they do not lead to better outcomes. The most comprehensive research, on statewide voucher programs in Indiana and Louisiana, found large negative results in both reading and math. Public elementary school students who started at the 50th percentile in math and then used a voucher to transfer to a private school dropped to the 26th percentile in a single year. In addition, these programs would likely not benefit vast swaths of America. The administration also proposes a 50 percent increase in the charter school program. High-quality charter management organizations, or CMOs, have a demonstrated record of improving student outcomes, in part because they grow deliberately, select their staff carefully, and develop community buy-in. It is unlikely that these organizations could sustain their performance while growing as rapidly as a 50 percent single-year increase would require. While incredibly vague on the details, the proposal also implies that the $1 billion increase in Title I would only go to districts that adopt the student budgeting and open enrollment practices. While the Center for American Progress has supported weighted student funding, it is disingenuous for the Trump administration to frame this funding as a significant increase to Title I. The budget eliminates funding for the $2.4 billion Supporting Effective Instruction State Grants program, or Title II, of the Every Student Succeeds Act, or ESSA, and the $1.2 billion 21st Century Community Learning Centers, or 21st CCLC, Title IV, Part B, of ESSA. Taken together, these cuts will deprive already vulnerable students’ equitable access to excellent instruction and after-school programs—critical resources and services that could make them less likely to live in poverty as adults. Title II is the major federal funding stream districts use to support their teacher workforce and ensure equitable access to high-quality teachers and principals for all students. The proposed elimination of Title II funds translates to a loss of 40,000 teachers’ salaries. California, home to the largest number of public school students, stands to lose $263 million in funding that could pay for more than 3,600 teachers’ salaries. Oklahoma, a mid-sized state, would lose $27 million, enough to support 600 teachers’ salaries, even as the state faces serious budget reductions. Even Alaska, a small state in the midst of a fiscal crisis, could lose $11 million that could pay for 167 teacher salaries. Cutting funds that states and districts would otherwise use to recruit, train, support, and compensate their teachers would be a devastating blow, especially to the regions of the country confronting teacher shortages. While there is no doubt that Title II funds could be better spent, Congress took a step toward improving the efficiency of the program in ESSA. Further efforts should be made to reform the program, but slashing this needed funding from state and local budgets is not the answer. President Trump’s budget also eliminates $1.2 billion in funding for after-school and summer learning programs across the country. This move would harm working parents, many of whom may rely on after-school and summer programming so that they can provide for their families. In fact, 8 in 10 participating parents say that 21st CCLC after-school programs help them keep their jobs. President Trump’s proposal to eliminate this program would affect the more than 1.6 million students currently attending a 21st CCLC program. For example, Klamath Falls City Schools in Oregon could lose their after-school and summer programming after four years of successful implementation. This would mean a loss of enrichment opportunities that provide a well-rounded educational experience, including sports, art classes, off-site field trips, and vital summer school courses for high school students working toward college credit. In Pennsylvania, which would see $42 million in cuts, the 21st CCLC Schuylkill Achieve after-school program, which helps raise money for families affected by cancer while inspiring students to serve others, could disappear. In addition to cutting supports to teachers and after-school programs, this budget doubles down on its attack on teachers and working families by eliminating funding for the Corporation for National and Community Service, or CNCS, which provides volunteer support and educational awards for teachers in training and out-of-school time programming. A recent analysis showed that a majority of competitive grant awardees in the AmeriCorps program, the largest CNCS program, go to educational programs in schools and serve students in 41 states and Washington, D.C. Furthermore, CNCS funds are crucial to the functioning of some of the most dynamic and effective education reform organizations—including KIPP Public Charter Schools, Success Academy Charter Schools, Boston Teacher Residency, Reading Corps, Boys and Girls Clubs of America, and Teach For America—and eliminating them would undermine these organizations’ ability to improve student outcomes. President Trump’s budget would hinder every state’s ability to deliver critical services and resources to their K-12 students. Trump’s elimination of the Supporting Effective Instruction State Grants and the 21st CCLC after-school program alone would mean a loss of nearly $3.6 billion in funding, impacting thousands of teachers and millions of students. The following table illustrates these figures for all 50 states and the District of Columbia. Funding for some of the largest federal education programs has barely risen since 2009. In addition, 23 states provide less general funding to schools in 2017 than before the recession in 2008. 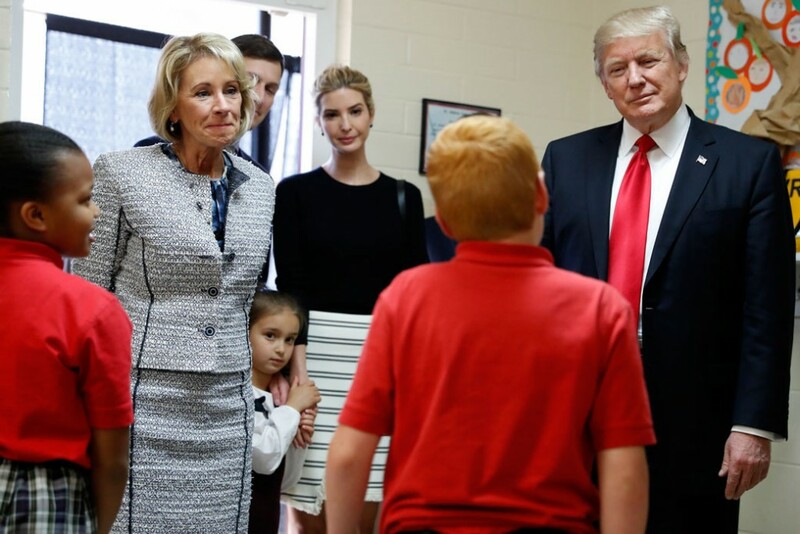 The Trump-DeVos budget threatens to exacerbate the budgetary challenge states face by cutting at least $3.6 billion from ESSA programs and $9 billion from the Department of Education overall while making an unprecedented investment in an ambiguous “school choice” program. These cuts will likely force schools to scale back and reallocate already limited resources, eliminate critical services, such as after-school programming, and potentially even lay off teachers. Sadly, but not surprisingly, this sloppy budget demonstrates that President Trump and Secretary DeVos will even throw vulnerable students under the bus to push an agenda that will not benefit most Americans. Stephenie Johnson is the Associate Campaign Director for the K-12 Education Policy team at the Center for American Progress. Neil Campbell is the Director of Innovation for the K-12 Education Policy team at the Center. Kami Spicklemire is an Education Campaign Manager at the Center. Lisette Partelow is the Director of K-12 Strategic Initiatives at the Center.